Results for the December 2016 SkillSelect invitation rounds have been released, and we have results up to the 21st of December 2016. After a few months of unusual SkillSelect activity, things appear to be back to normal and we have a good indication of what to expect for most of the pro-rata occupations. 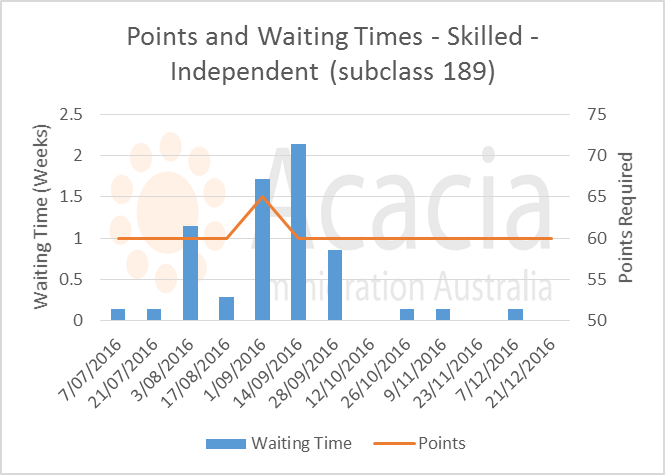 This article summarises the recent trends for Skilled Independent Subclass 189 and Skilled Regional Provisional subclass 489 applicants. The 21 December round saw a increase to 1859 invitations - this was up from only 606 for the 7 December round. The current planning level is 1600 invitations for 189 applicants per round - so there is a lot of ground to make up for low numbers in the rounds for the last 2 months. There are 8 Pro Rata Occupations - where more eligible EOIs are being lodged than there are places for the occuaption. Waiting times and/or points scores for these will be higher than normal. For the 23 November 2016 round, Nurses were included as a "pro rata" occupation. Immigration has clarified that this was done in error and that Registered Nurses are not pro rata at this stage. 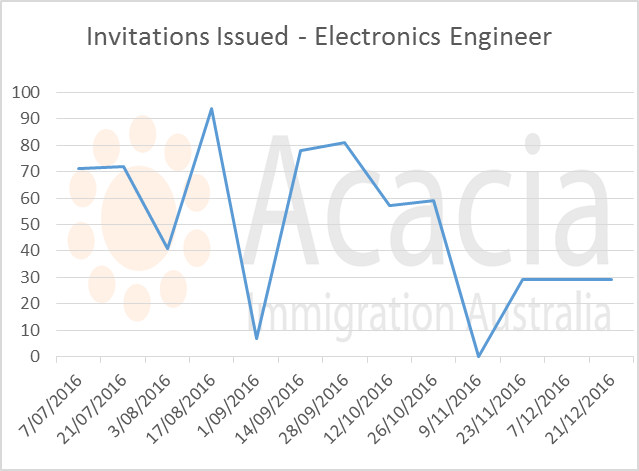 Waiting times continue to increase steadily, suggesting that the minimum points for a 189 invitation will stay at 70 for the time being. 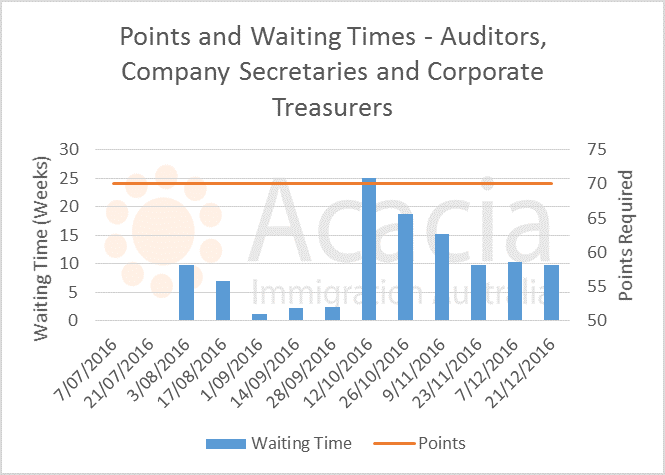 Waiting time for auditors has stabilised at 10 weeks, which is now less than for accountants at 14 weeks. We expect the minimum score for an invitation to remain at 70 points. No invitations were issued for ICT specialisations on 7 December. 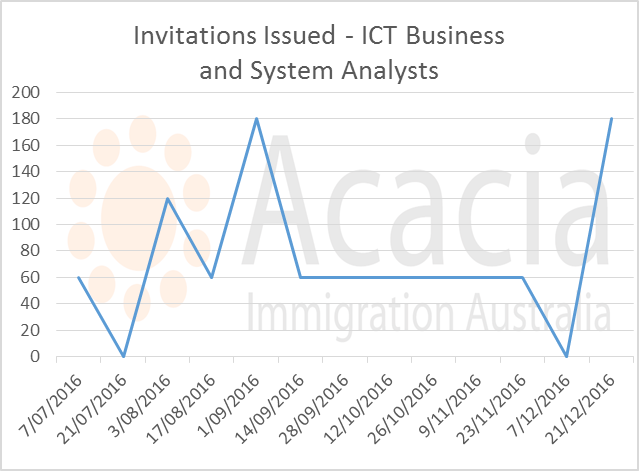 On 21 December 180 invitations were issued for ICT Business Analysts which is 3 times the usual number of 60. Minimum score remains at 65 points, and this looks likely to remain the case. 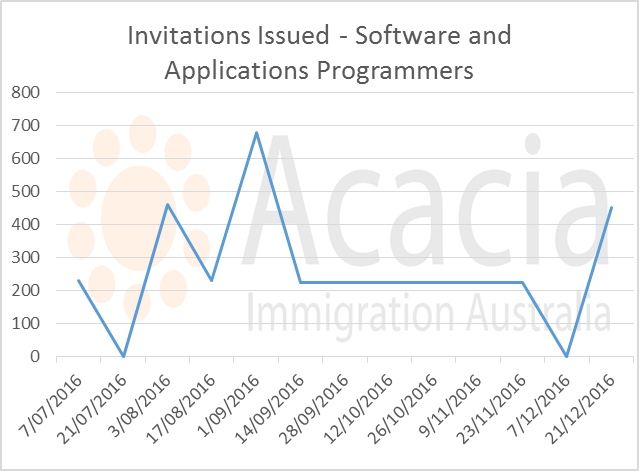 450 invitations were issued on 21 December for Software and Applications Programmers which is double the usual amount. 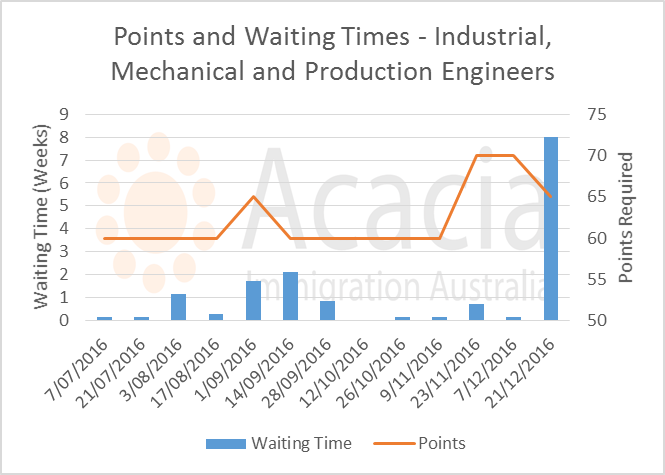 Waiting times have been increasing steadily but are still only 4 weeks, so we expect the minimum score to stay at 65 points for a 189 invitation for this occupation. 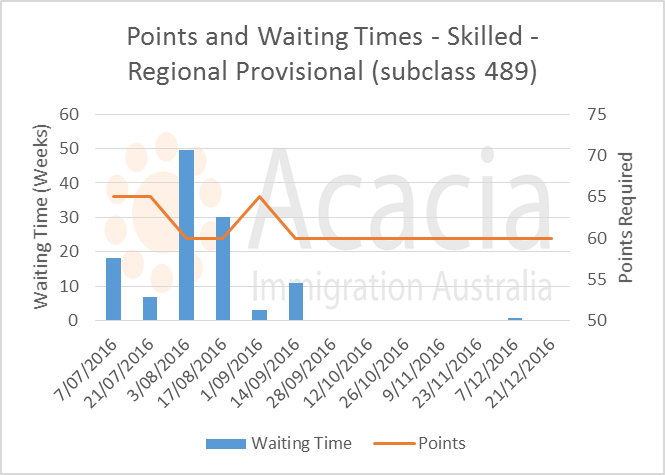 Minimum score for this occupation is 65 points, and waiting time is now over 5 weeks. Only a low number of invitations are issued for this occupation each round (29), and the minimum score for invitation is 65. 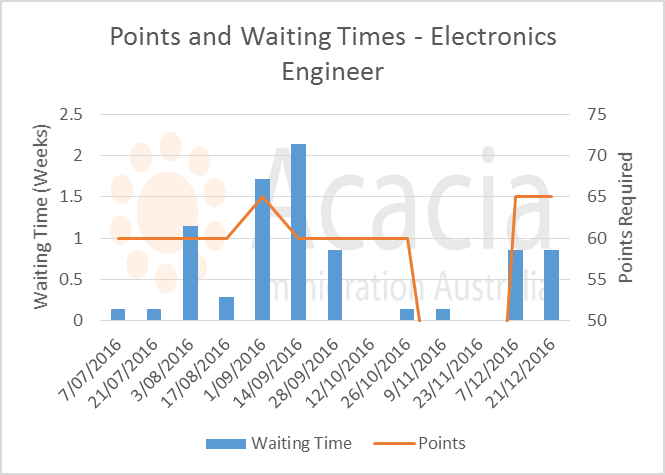 At this score, the waiting time is minimal suggesting that the required points may reduce back to 60 for this occupation - depending on EOI application numbers. This occupation is the one closest to being filled, and the required points for an invitation increased to 70 in November. This is now back down to 65 points, and you can expect to wait 8 weeks for an invitation at this score. Only 17 invitations are issued each round for this occupation, so there may be some volatility in the results going forward. No invitations were issued for this occupation on 7 December, and double the usual number on 21 December (56). Minimum score for an invitation is 65 points, and you would expect to wait 6 weeks for an invitation with this score. 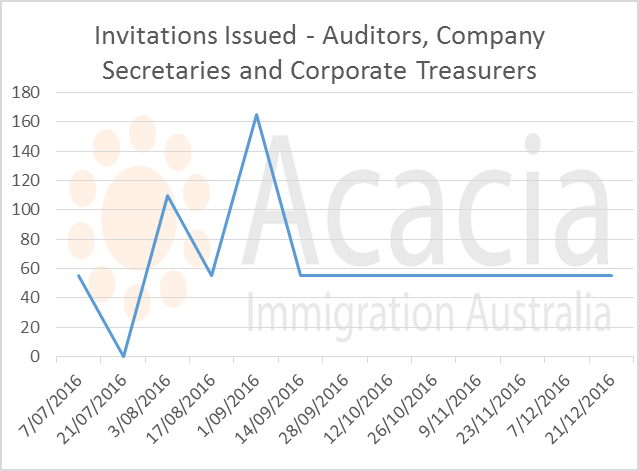 Minimum score for an invitation for a family sponsored 489 visa remains at 60 points. 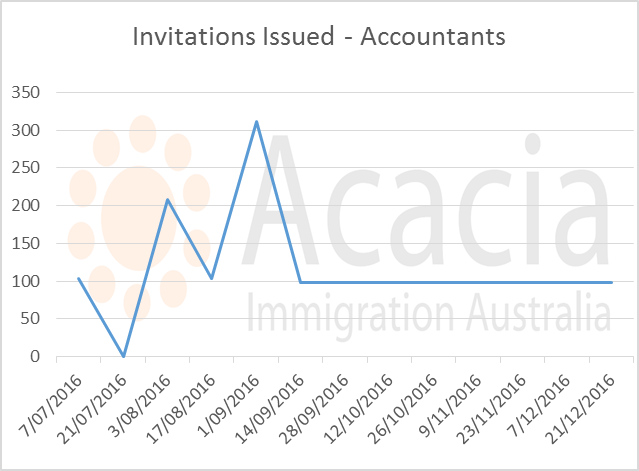 The planning level appears to be 100 invitations per round for this visa category, but far fewer invitations are being issued than this. 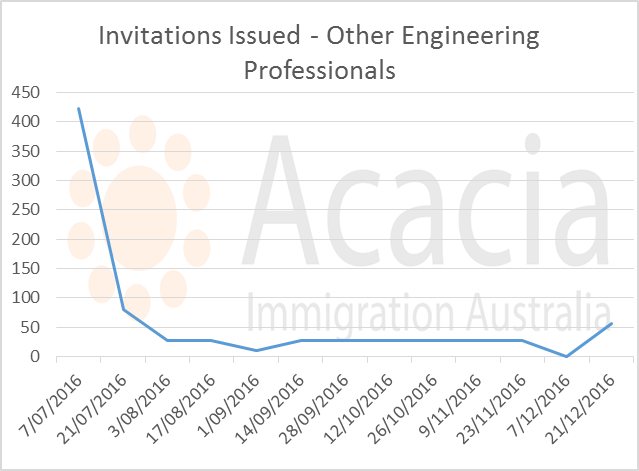 On 9 November, only 15 invitations were issued for 489 applicants. Whilst this is now back up to 38 for the 21 December round, it appears that insufficient eligible applicants are available to fill the 489 quota. After a few months of uncertainty, SkillSelect seems to be back to an even keel with results a bit more predictable. Registered nurses will be relieved that they are not on the pro rata list. The situation for accountants and auditors remains difficult with 70 points being required for a 189 invitation - this seems unlikely to change. Engineers and IT Professionals are in a better situation with 65 points being required, and it's possible this might reduce for some specialisations. 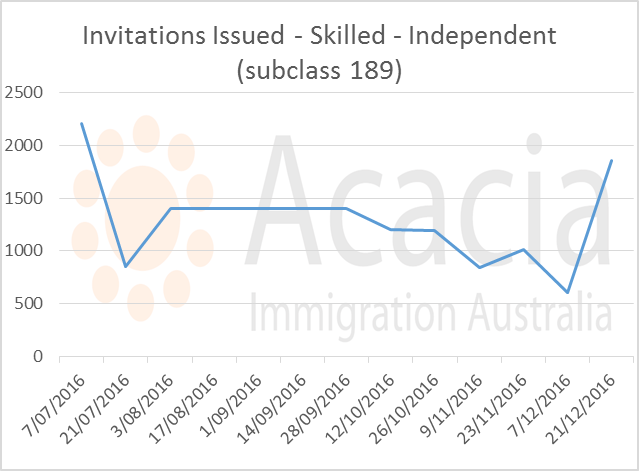 Looking at the program overall, it seems that Immigration is not meeting its quota for SkillSelect invitations. If this trend continues, Immigration will not meet their program planning level for General Skilled Migration. This might result in the relaxation of some restrictions in SkillSelect - possibly an increase in some occupational ceilings or allowing invitations for more family sponsored 489 applicants. As usual, we will keep you posted on any developments!